The new Mikuni World Stadium proved a fitting stage for the world’s best women’s sevens players to perform on and New Zealand, Australia and Canada rose to the occasion to finish top of their respective pools at the HSBC Kitakyushu Sevens. Australia then had their Fijian-born flyer Ellia Green to thank for a strong start against familiar opponents in the Pool B decider, scoring twice for a 12-0 half-time lead for the series champions. Fijiana, so impressive against Ireland and Brazil, couldn’t find a way through until the final few minutes when tries by Miriama Naiobasali and captain Ana Maria Roqica had Australia hanging on for a 17-12 win to preserve their perfect record. A double from Alena Mikhaltsova, who led the DHL Series Performance Tracker coming into round four, helped Russia to an opening win, 26-5 over their fellow Europeans France. She was on the scoresheet again in their second match against hosts Japan where Russia’s great pace and power proved the difference. The home fans did have something to cheer about, though, when teenager Honoka Tsutsumi spotted a gap and went over for her country’s first try of the tournament in a 29-5 loss. Series leaders New Zealand were a daunting first opponent for hosts Japan, who will return to the series as a core team in 2017-18, first up and Portia Woodman grabbed the first of ther side’s five tries in a 31-0 victory. The Black Ferns Sevens didn’t have it all their own way against France and were on verge of a first-ever series loss to Les Bleues until they played their get out of jail card with tries from Niall Williams and Tyla Nathan-Wong at the death securing a 19-14 win to confirm their quarter-final place. France cast aside that last-gasp heartbreak to beat Japan 33-5 and secure a place in the quarter-finals as the best third-placed side, Jade le Pesq – one of their standout player in the Women’s Six Nations earlier this year – crossing for two of their five tries. Shouts of ‘Nippon, Nippon’ rang out around the stadium throughout, increasing in volume when Tsutsumi scored her and Japan’s second try of the day. Fijiana’s quest for a first Cup semi-final appearance could not have got off to a better start with a record 45-0 defeat of Ireland, the Pacific islanders throwing the ball around at will and leaving their opponents all at sea, Tima Ravisa and Raijieli Daveau crossing for two apiece. Brazil caused them a few problems early on but Fijiana finished strongly with Miariama Naiobasali grabbing four of their six tries in a 34-7 win to confirm their quarter-final place. Australia were equally impressive in their first two matches, coach Tim Walsh’s strategy of giving youth a chance to shine in Japan paying off with Demi Hayes, Emma Sykes (2) and Dominique du Toit all crossing in a 38-0 win over Brazil first up. Olympic gold medallists Emilee Cherry and Ellia Green (2) were then among the try scorers in a dominant 36-0 defeat of Ireland. USA came out of the blocks quickly in the opening match with the power of Kristen Thomas and hot-stepping of captain Alev Kelter helping them to a 19-0 half-time lead over Spain. Las Leonas did battle back in the second half with Patricia Garcia at the heart of everything, but they left themselves too much to do and went down 19-10. The Women’s Sevens Eagles enjoyed another clinical first half against England, Naya Tapper scoring a hat-trick to inspire her side to only their fourth win in 13 series meetings with the Red Roses, 27-5 the final score. 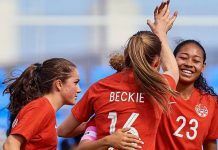 Canada signalled their intention to follow up their men’s team’s success in Singapore last weekend with a second title of their own this season with Brittany Benn atoning for her yellow card with two second-half tries against a much-improved England outfit in a 29-12 victory. However, an end-to-end try by Julia Greenshields was the stand-out score. Canada then crossed for seven tries, two of them in quick succession from Bianca Farella, for a 43-5 win over Spain to set up the expected pool decider with USA.